Yale-NUS College is a liberal arts college located in Singapore, recently established in 2011 as a collaboration between the National University of Singapore, and Yale University in the United States. Notably, it is the first time in 300 years of history that Yale University has developed an institution outside of USA. As new as it may be, it has been making waves among Singaporean students as a premier university for higher learning that offers an all-rounded and holistic educational experience well suited to Liberal Arts students. In this article, Raffles Press interviews Tan HengYeng, an alumna (Year 2013) who is currently pursuing a liberal arts degree at Yale-NUS College, to find out more about her experiences so far. Press: What CCA were you in back in RI, and what subject combination did you take? HengYeng: My CCAs were Trampoline Gymnastics and Interact Club. I took Geography, Economics, English Literature, Mathematics (GELM) and H3 Literature. P: Tell us about the university you’re currently in. HY: I’m in my freshman year at Yale-NUS College. We’re a very young institution, but that’s good because it means that students have a say in shaping the school, such that we can create something that’s fresh, brand new and dynamic for the school. When you do liberal arts, you basically do anything you want – for instance, I can take modules across various disciplines that I want to learn more about and explore them. That also means I’m more or less in charge of moulding my academic experience. I love that I’m not confined to a specific major as of yet! Students will choose a major in the last two years, but we still have the option to take electives in subjects that interest us, however unrelated to our major they may be. There are a bunch of different majors you can take across disciplines, and right now I’m considering either Literature or Arts and the Humanities. Mostly it’s been a very exciting and fulfilling first semester, full of trying new things and meeting the most amazing interesting people from all over the world, and also having the best conversations and getting up to the silliest fun. P: Describe a typical day in your life as a university student. HY: I usually do classes, then some readings, some sort of sport (tennis, rock climbing, dance), meals together with everybody (a nice break from work), hanging out with my suite-mates followed by different student events – an art show one night, or a mixer, a meeting to form our new constitution, etc. P: What do you do during leisure time? HY: The first semester at Yale-NUS is ungraded – it’s a pass-fail semester so it’s really up to you how seriously you want to take your academics at that point. Undoubtedly the academic rigour is there, because the professors definitely expect a certain level of intelligent thought in your work. But the point of an ungraded semester is for you to be able to focus on other things and I really love that – you can get a feel of how much you can load on your plate while balancing work, and you also get to take academic risks that you may not have if the grades had counted. Most of my class is also making full use of this ungraded semester to try new things and focus on co-curriculars, such as getting clubs and activities up and going – no-sleep nights are 99% of the time a consequence of non-academic activities, from cycling to Holland V for supper with friends to movie marathoning or just heartfelt conversations. The academic workload is definitely dependent on the individual – how prepared you want to be for classes, how many extra readings you want to do, how much effort you want to put in your papers etc. You can definitely get by fine just skimming your readings or even not doing much work at all. It’s up to you what to focus on. P: What extracurricular activities/enrichment activities does Yale-NUS offer? Is there anything particularly noteworthy/interesting? 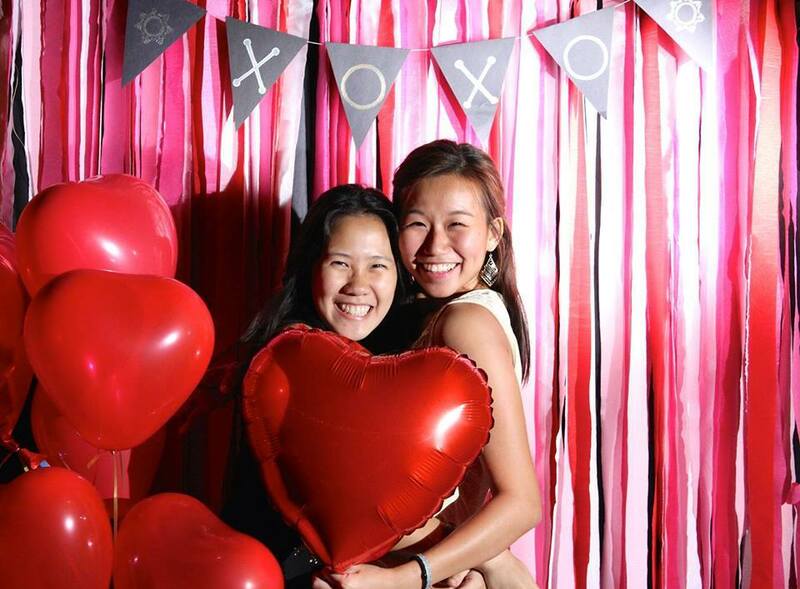 HengYeng (right) during XOXO in 2015, an event she helped to organise to commemorate Valentine’s Day in Yale-NUS. Enrichment programmes wise, we’re seriously spoilt for choice. I can’t do it justice here but please do check our programmes out on the Yale-NUS website! They include research opportunities, overseas exchanges, immersion programmes and such. Summer at Yale-NUS is definitely one of the most exciting part of things! I chose Yale-NUS over studying overseas partly because of the overseas exposure they offered. In the one semester that I’ve been here, my entire class has had at least two overseas opportunities and I travelled to Borneo and London. Yale-NUS is greatly supportive of growing yourself both as a student and as a person. P: Do you have dorm-mates, and how has it been like living with them? HY: Yale-NUS follows the liberal arts college tradition of 24/7 residential living, and until I got here I didn’t realise how significant that is. The community here is absolutely amazing, and I adore living and learning with my friends. If I’m bored at 3am in the middle of the night I can simply walk into someone else’s room and talk about anything from silly college gossip to deep existential questions or chill at the common lounge with people or even have spontaneous jam sessions. Our class of 170 students hails from ~35 different nationalities, so, as you can imagine, the conversations have been pretty incredible. Residential living is definitely one of the most precious aspects of college for me, because it affords me so much opportunity to do things, be it planned or spontaneous – things like dialogue sessions with K. Shanmugam, milk and cookies on Thursday nights, Open Mic nights (where we get to see mind-blowing talent! ), mixtape swaps, Oktoberfest and also night-cycling, just to name a few! P: Do you regret choosing to study locally? HY: Absolutely no regrets; I wouldn’t swap my place at Yale-NUS for a spot at any other school on this planet. I may be biased since Yale-NUS was the only school I even applied to because I was (and still am) sure that it was what I wanted! P: What’s the general ambience of the campus like? How about the physical impressions the campus gives you? HY: I personally like being next to NUS’s campus for now because they have facilities I can use, such as their climbing wall, pool, food court and more. But many people would disagree with me because of differing interests. I’m excited to move to the new campus and make it our own! However it can be a bit frustrating to be seen as a subsidiary of NUS when we aren’t and it also has unfortunate effects on the development of our identity, and reputation, as a completely new independent college. A view of the campus of Yale-NUS. P: Did you have trouble acclimatizing to the university environment? Did you face any culture shocks? How did you manage to adapt? HY: It’s pretty different I would say! Raffles felt very much like home – but Yale-NUS is just, wow. One of the key differences is the exposure to so many new people from all over the world with different mindsets and cultural backgrounds – I’ve learnt so much just by being with and talking to such diverse individuals. In comparison, in Raffles most of us came from somewhat similar socio-economic backgrounds and often went through the same educational track up to JC, and as a result we’ve had many similar experiences which is why we’ve also been conditioned to think in a certain way. It was the system we were put through. The thirst for perfect grades is also something you don’t see, which I found refreshing after twelve years of the Singaporean education system which advocated straight As above all else. The mindset here is very much that other things in our lives also count! Other than that, there’s a fearlessness about failure I’ve never encountered before – I find that Yale-NUS kids are not afraid to take risks and embrace failure, something I think Rafflesians can definitely work on. Perhaps the culture shock isn’t as great here at Yale-NUS than it would be at an overseas university, because Singaporeans are still the majority (~55%) – so there’s a comfortable balance between stepping out of your comfort zone, and still being able to feel at home. P: Does Yale-NUS provide student support? HY: It does, in the form of lots of advisors and the like. But the best form, unique to Yale-NUS, is the help we get from our Deans Fellows who already graduated from elsewhere – usually other small, liberal arts schools like Amherst, or Yale. They help us out in ways such as talking to us, organizing fun activities, communicating with staff on our behalf, and they’re all wonderful. They’ve coordinated a Wellness Week involving recreational activities for students with the likes of yoga and social media challenges (‘tag your friends’, posting videos, etc) – and also organised “College 101” classes about studying, established a meditation room, and held kayaking trips! Besides the Dean Fellows, we also have psychologists and counsellors we can see anytime on site. P: In your opinion, is there any particular type of student that would thrive in Yale-NUS? HY: I think adventurous is the main trait that makes one suitable for YNC. You can make it work as an introvert, but it does take a lot of energy to try so many new things, meet new people and such – so you’ll fit in best if that idea excites you rather than stresses you out.